The Arnold Palmer is a refreshing non-alcoholic mixed drink that mixes two great summer beverages. 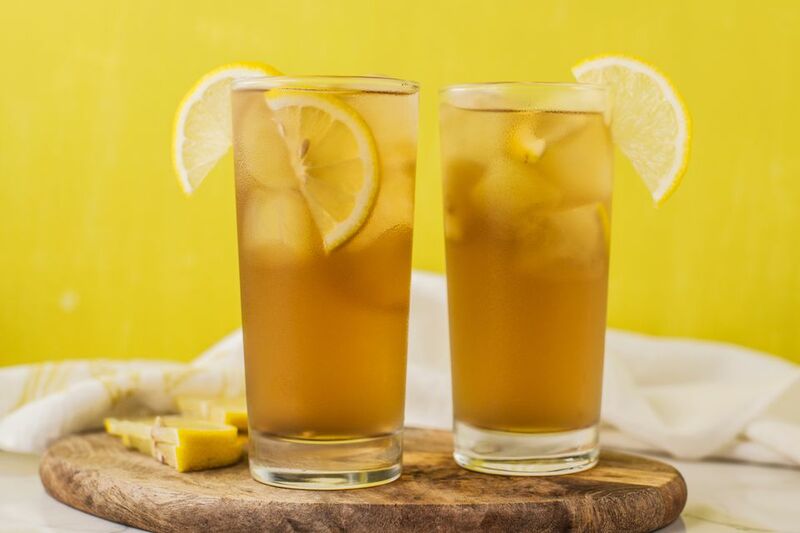 This simple recipe of ice tea and lemonade was created by the golfing legend, Arnold Palmer. His namesake mocktail was just one of his favorite drinks and it's sure to become one of yours. Possibly the best part about the Arnold Palmer is that almost everyone knows how to make it. It is such a popular drink that you can order it at virtually any bar and restaurant and never be disappointed. It's perfect for a casual lunch, for the non-drinker, and the designated driver. The mix of tea and lemonade is a perfect match and it is so easy to prepare, especially if you regularly stock the two in your refrigerator. While it is simple, there are many ways to improve on it as well. From fresh-made ingredients to spiking it with liquor, and even adding a little flavor, the Arnold Palmer is a perfect base that you can tailor to your personal taste. Pour the lemonade and iced tea into a tall glass filled with ice. This drink is not just named after Arnold Palmer, he actually did create it along with his wife, Winnie. The two concocted it one afternoon on the patio and he instantly fell for its refreshing taste. Quite famously, Palmer was known to carry a thermos on the golf course with him whenever he teed off. In the 1960s, the drink became known as the Arnold Palmer and it has been a favorite mocktail ever since. While many of us think of it as an equal mix of tea and lemonade—it's even often called a "half and half"—that is not how Palmer made it. The 1:1 mix is good, but if you try it as a three-part drink as written in the recipe, you might be pleasantly surprised. With the 2:1 mix you get a bold tea flavor with a sweet-tart lemonade background. The difference is considerable and even if you want to revert to your old half and half ways, at least you know how Palmer himself preferred it. No matter which ratio you choose to mix the Arnold Palmer at, it deserves only the best ingredients. With only two things to pour, there's nothing to lose and you might as well go for the best. On the lemonade front, it's always best to make your own. Homemade lemonade is incredibly simple to make and the fresh taste outshines anything you can buy. All you need is water, sugar, and a few lemons. Plus, as you'll see, you can play around with it and bring in hints of flavor. You have many options when it comes to the tea, just make sure that it's the freshest brew possible. Black teas are often preferred for iced tea and it is the top choice for the Arnold Palmer as well. However, think about brewing up a pitcher of oolong iced tea. It has a natural sweetness that puts a subtle spin on the drink. For the most flavorful (and least tinny-flavored) iced tea, use the hot brew method. Each type of tea has preferred brewing times and temperatures and tea companies include an optimum brewing time on the packaging. If you follow these suggestions with hot water, remove the tea bags, then give it a nice, long chill, you will see a great improvement in the taste of your iced tea. One of the best ways to add extra flavor to the Arnold Palmer is with a flavored simple syrup. These easy homemade drink mixers can take on any flavor, from flowers and herbs to sweet fruits, and can add a real spark to the drink. You can approach this one of two ways. One option is to add the flavor to the lemonade itself by replacing plain simple syrup with one that's infused. For instance, this lilac simple syrup makes a fantastic lemonade and equally tasty Arnold Palmer. Strawberry syrup is another favorite and mint, lavender, rose, and any berries are also good options. If you already have your lemonade made, your other option is to sweeten the Arnold Palmer directly with a flavored syrup. Just a small amount should do and you can always adjust it to taste. Traditionally, an Arnold Palmer is completely alcohol-free. However, that doesn't mean you can't spike it. When you're entertaining, consider placing a pitcher of Arnold Palmer on the table. Add a couple bottles of liquor and let your guests decide if they'd like it spiked or not. It's perfect for a casual gathering and everyone gets the drink they prefer.